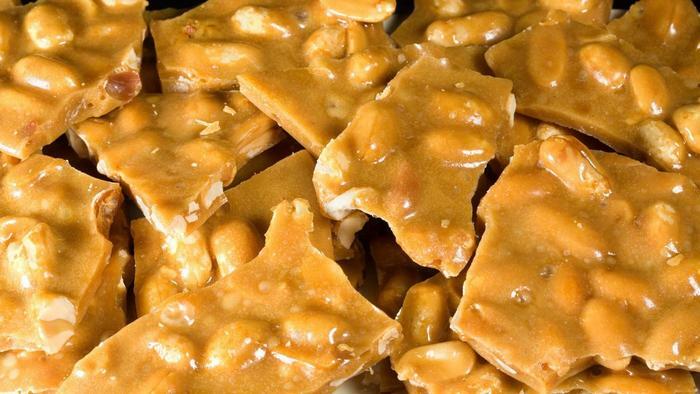 The best way to make peanut brittle is on the stove top. If you must use the microwave this recipe is consistently good. Combine peanuts, sugar, syrup, and salt in a 2-1/2 quart microwave safe container. 700 watt oven: Microwave 4 minutes on HIGH POWER; stir, microwave 4 minutes longer on HIGH POWER. Stir in butter and vanilla. Microwave 2 minutes longer on HIGH POWER. 1200 watt oven: Microwave 4 minutes on 60 PERCENT POWER; stir; microwave 4 minutes longer on 60 PERCENT POWER. Stir in butter and vanilla. Microwave 1 minute longer on 60 PERCENT POWER. 1500 watt oven: Microwave 4 minutes on 50 PERCENT POWER; stir; microwave 4 minutes longer on 50 PERCENT POWER; stir in butter and vanilla. Microwave 1 minute longer on 50 PERCENT POWER. ***NOTE: Any cooking time adjustments necessary for lower or higher watt ovens must be made before adding baking soda. 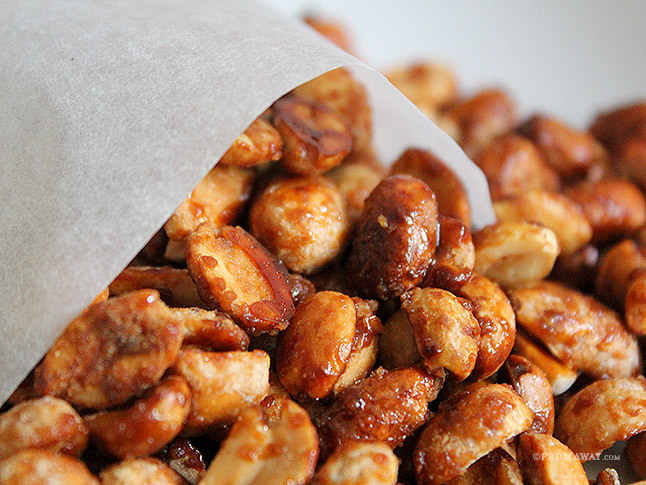 Simple recipe makes outstanding candied peanuts. In a large saucepan, combine first four ingredients. Cook and stir over medium heat for 20 minutes or until most of the liquid is absorbed. Spread onto a greased 15” x 10” x 1” pan; sprinkle with salt. Bake for 24-26 minutes stirring every 6 minutes. Remove to a wax paper-lined cookie sheet to cool. The best way to do peanut brittle is on the stove top. This is the best recipe we’ve ever come across. Put corn syrup, sugar, butter and salt in a 4-qt saucepan. Put on medium heat stirring constantly until sugar dissolves. Add the peanuts (keep stirring constantly) and take mixture to 290° on a candy thermometer. Remove from heat and stir in baking soda. Pour on prepared cookie sheet. Don’t spread too thin. This brittle is best when left at least ¼” thick. Let cool, break up and enjoy. 2016 Iowa State Fair winner and for good reason. Absolutely delicious toasted and spread with a little butter and honey. In large mixer bowl combine 2 1/2 cups flour and the yeast. In saucepan, combine butter, milk, sugar, honey and salt. Heat till warm (115-120°). Add this liquid mixture to mixer bowl and beat thoroughly. Add the eggs and another 2 1/2 cups of flour and beat well. 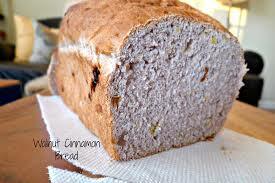 Add the walnuts, cinnamon and remaining 1/2 cup of flour and beat until dough is stiff. Turn out on floured surface, knead 4 minutes. Place in very large bowl - cover - let rise double. Punch down and divide into 2 equal portions. Shape loaves, place into greased 9 x 5 inch loaf pans. Whisk 1 egg white with 1 Tbsp. water and use to brush atop loaves. Let rise until light. Bake at 350° 45-50 minutes. Remove from pans and cool on rack.